Fractional distillation is a special type of distillation designed to separate a mixture of two or more liquids that have different boiling points. The process involves heating the mixture and partial condensation of the vapors along a column (fractionating column), which is set up such that components with lower boiling points pass through the column and are collected earlier than components with higher boiling points. Generally, this method is used when the component parts boil at less than 25 °C from each other under a pressure of one atmosphere (atm). The separation technology of fractional distillation is useful in both research and industrial settings. In industry, it is commonly used in petroleum refineries, chemical plants, and natural gas processing plants. Likewise, if a sample of air is liquefied, it can be separated into its components to produce liquid oxygen, liquid nitrogen, and argon. Also, chlorosilanes can be distilled to produce high-purity silicon for use as a semiconductor. 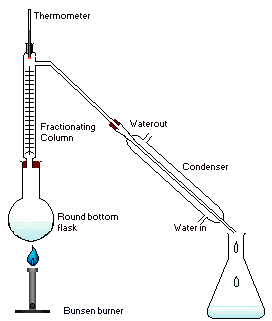 An example of a fractional distillation apparatus used in a laboratory. The diagram shows the use of a Liebig condenser and a conical flask as a receiving flask. Here, the distillation head and fractionating column are combined in one piece. rubber bungs, unless laboratory glassware with ground glass joints is used, such as a quickfit apparatus. The apparatus is assembled as in the diagram (which represents a batch apparatus, as opposed to a continuous apparatus). The mixture is put into a round-bottom flask along with a few anti-bumping granules, and the fractionating column is fitted over the mouth of the flask. As the mixture boils, vapor rises up the column. The vapor condenses on the glass platforms, known as trays, inside the column, and runs back down into the liquid below. This is known as "refluxing" the distillate. Only the most volatile fraction of the vapors remains in gaseous form all the way to the top of the column. This fraction passes into the condenser, which cools it down until it liquefies, and this liquid is collected in the receiving flask. The efficiency in terms of the amount of heating and time required to get fractionation can be improved by insulating the outside of the column with an insulator such as wool, aluminum foil, or (preferably) a vacuum jacket. The hottest tray is at the bottom and the coolest is at the top. At steady state conditions, the vapor and liquid on each tray are at equilibrium. The fractionation is more thorough with the addition of more trays (up to certain practical limitations). In laboratory distillation, any of several types of condensers may be used. The Liebig condenser is simply a straight tube within a water jacket, and is the simplest (and relatively least expensive) form of condenser. The Graham condenser is a spiral tube within a water jacket. The Allihn condenser has a series of large and small constrictions on the inside tube, each increasing the surface area upon which the vapor constituents may condense. In alternate set-ups, a "cow" or "pig" adapter may be used, connected to three or four receiving flasks. By turning the "cow" or "pig," the distillates can be channeled into the appropriate receiver. A Perkin triangle may also be used to collect distillation fractions, without requiring a "cow" or "pig" adapter. A Perkin triangle is most often used when the distillates are air-sensitive, or when the fractions distill and are collected under reduced pressure, but it can be used for simple as well as fractional distillations. Vacuum distillation systems operate at reduced pressure, thereby lowering the boiling point of the materials. Consider the distillation of a mixture of water and ethanol. Ethanol boils at 78.5 °C, and water boils at 100 °C. On that basis, one should be able to separate the two components by fractional distillation. However, a mixture of 96 percent ethanol and four percent water boils at 78.2 °C, being more volatile than pure ethanol. Such a mixture is called an azeotrope. When the mixture is gently heated, the azeotrope (being the most volatile component) concentrates to a greater degree in the vapor and separates from the rest of the liquid first. Thus, fractional distillation of a mixture of water and ethanol produces 96 percent ethanol. Once all the ethanol has boiled out of the mixture, the thermometer shows a sharp rise in temperature. 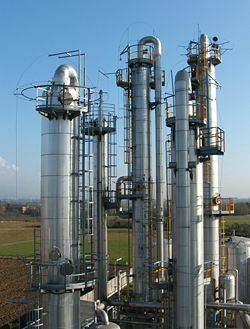 Typical industrial fractional distillation columns. Fractional distillation is the most common form of separation technology used in petroleum refineries, petrochemical and chemical plants, and natural gas processing plants. For example, this technique is used in oil refineries to separate crude oil into useful substances (or fractions) consisting of different hydrocarbons with differing boiling points. The crude oil fractions with higher boiling points consist of larger molecules (with more carbon atoms and higher molecular weights), are darker in color, are more viscous, and are more difficult to ignite and to burn. Most often, new feed is continuously added to the distillation column, and products are continuously removed. Unless the process is disturbed due to changes in feed, heat, ambient temperature, or condensing, the amount of feed being added and the amount of product being removed are normally equal. This is known as continuous, steady-state fractional distillation. Industrial distillation is typically performed in large, vertical cylindrical columns known as "distillation or fractionation towers" or "distillation columns." Their diameters range from about 65 centimeters to six meters, and their heights range from about six meters to 60 meters or more. The distillation towers have liquid outlets at intervals up the column, allowing for the withdrawal of different fractions or products with different boiling points or boiling ranges. The "lightest" products (those with the lowest boiling point) exit from the top of the columns and the "heaviest" products (those with the highest boiling point) exit from the bottom of the column. Fractional distillation is also used for the separation of (liquefied) air into its components, producing liquid oxygen, liquid nitrogen, and high purity argon. Distillation of chlorosilanes enables the production of high-purity silicon for use as a semiconductor. Diagram of a typical, large-scale industrial distillation tower. Large-scale industrial towers use reflux to achieve a more complete separation of products. Reflux refers to the portion of the condensed overhead liquid product from a fractionation tower that is returned to the upper part of the tower as shown in the schematic diagram on the right. Inside the tower, the reflux liquid flowing downward provides the cooling needed to condense the vapors flowing upward, thereby increasing the effectiveness of the distillation tower. The more reflux is provided for a given number of theoretical plates, the better the tower's ability to separate lower boiling materials from higher boiling materials. Alternatively, the more reflux provided for a given desired separation, the fewer theoretical plates are required. In industrial uses, sometimes a packing material is used instead of trays within the column, especially when operating under reduced pressures. This packing material can either be random dumped packing (one to three inches wide) such as Raschig rings or structured sheet metal. Liquids tend to wet the surface of the packing and the vapors pass across this wetted surface, where mass transfer takes place. Unlike conventional tray distillation, in which every tray represents a separate point of vapor liquid equilibrium, the vapor liquid equilibrium curve in a packed column is continuous. However, when modeling packed columns, it is useful to compute a number of "theoretical plates" to denote the separation efficiency of the packed column with respect to more traditional trays. Differently shaped packings have different surface areas and void space between packings. Both of these factors affect packing performance. Chemical engineering schematic of typical bubble-cap trays in a distillation tower. 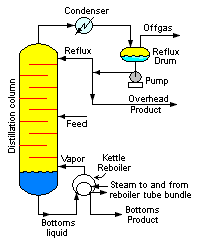 Design and operation of a distillation column depends on the feed and desired products. Given a simple, binary component feed, analytical methods such as the McCabe-Thiele method or the Fenske equation can be used. For a multi-component feed, simulation models are used both for design and operation. Moreover, the efficiencies of the vapor-liquid contact devices (referred to as plates or trays) used in distillation columns, as seen in Figure two, are typically lower than that of a theoretical 100 percent efficient equilibrium stage. Hence, a distillation column needs more plates than the number of theoretical vapor-liquid equilibrium stages. ↑ If the difference in boiling points is greater than 25 °C, a simple distillation method is used. ↑ Given the formation of an azeotrope, ethanol cannot be completely purified by direct fractional distillation of ethanol-water mixtures. ↑ Henry Z. Kister, Distillation Design, 1st ed. (McGraw-Hill, 1992, ISBN 0-07-034909-6). ↑ 4.0 4.1 4.2 Robert H. Perry and Don W. Green, Perry's Chemical Engineers' Handbook, 6th ed. (McGraw-Hill, 1984, ISBN 0-07-049479-7). ↑ Milton, Beychok (May 1951). Algebraic Solution of McCabe-Thiele Diagram. Chemical Engineering Progress. ↑ J. D. Seader and Ernest J. Henley, Separation Process Principles (New York: Wiley, 1998, ISBN 0-471-58626-9). This page was last modified on 21 April 2017, at 14:21.